September 19, 2018 — This fall, the Chief Administrative Officer (CAO) for the Division of the Vice-President & Provost, Catherine Gagne, and her husband, Engineering Professor Jim Wallace, will each receive the University of Toronto (U of T) Long Service Award, for 25 and 40 years of service respectively. A look into their combined 65 years reveals much of what defines U of T’s excellence: its people. A President’s Teaching Award winner and member of the Teaching Academy, Prof. Jim Wallace is a distinguished educator motivated by his students. He is full of anecdotes of chance encounters with graduates he taught, from pilots to home inspectors — after 40 years of teaching, hearing “Professor Wallace!” while out and about is not uncommon. Wallace started at U of T as a professor in Engineering in 1978. Both teaching and research benefitted from the wonderful practical experience gained during a meaningful stint in the US Navy. Though his heart is in the classroom and in his research lab, he has also served in various administrative roles, including as the Chair of the Department of Mechanical & Industrial Engineering from 1998 to 2003. U of T offers exceptional opportunities for research collaboration with outstanding colleagues and graduate students. Gagne has held multiple administrative positions at the University, spanning both central and divisional operations. She welcomes opportunities for occupational renewal and has embraced it as part of her professional philosophy. This has given her a unique understanding of U of T’s ins and outs, which she has shared throughout her career to foster leadership and teamwork. Gagne began at U of T in 1993 with a serendipitous start covering a maternity leave for a Business Officer position, thinking it would be a short stay in a job history that already included working in the Alberta oil patch, a two-year project with Microsoft, and administration of the Canadian Kennel Club. She’s since stayed at U of T because of the many professional development opportunities and her brilliant colleagues. The two met 18 years ago, when Gagne interviewed for her third role at U of T—Wallace was on her Search Committee. As a potential romance discretely blossomed, their work supporting University staff, students and faculty remained paramount. Wallace was on the Con Hall stage when Gagne graduated with a Masters of Information in 2017. This is not the first time their U of T paths have crossed for a momentous occasion. 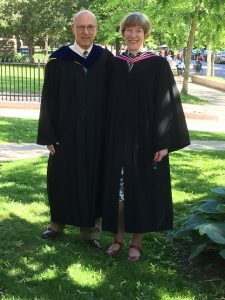 As a member of the academic procession, Wallace was on the Con Hall stage when Gagne graduated with a Masters of Information in 2017, making it very special for her. 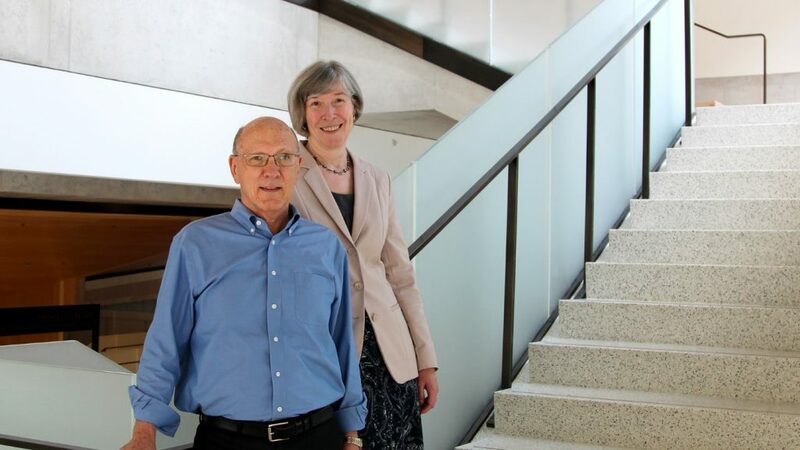 After a combined 65 years of service, their dedication to the U of T is an integral part of their relationship The couple works on balancing their professional and personal lives but admits, at times, they are married as much to their work as they are to each other. It’s clear though, that their admiration and love for one another is the foundation for all they do. This story originally appeared on the U of T Human Resources & Equity site.